England: 1655. A nation reeling from the turmoil of bloody civil war. An island in the iron grip of Oliver Cromwell's Protectorate. The forces of King Charles have been utterly defeated. The sovereign is dead, his supporters beaten, humiliated and scattered. But it is not just former Cavaliers who find themselves hounded by the new regime. Many of those who fought for Parliament have fallen foul of the oppressive rule of the Major-Generals. One such man is Major Samson Lyle: Roundhead, outlaw, fugitive. Forced into exile after a dispute with the ruling elite, he has returned, intent on waging war against those now in command. Skilled with pistol and blade, Lyle takes the fight onto the busy roads south of the capital, forging a formidable reputation as a notorious highwayman. Along with his trusted young ward Bella, and Eustace Grumm, an irascible former smuggler, Lyle dodges the ever-present threat of capture to menace those against whom he has sworn revenge. But when the robbery of a powerful lawyer alerts Lyle to the imprisonment of a former comrade, the Major is plunged into a dangerous game of intrigue and deceit that may finally prove his undoing. And he must tread carefully, for Parliament have dispatched their own man to hunt the elusive outlaw. 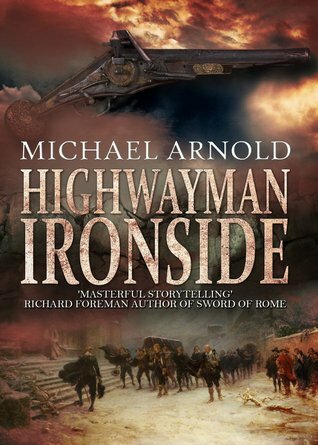 Highwayman Ironside was an entertaining short read with plenty of action and adventure. A handful of times my inner editor grumbled at comma splices, but for the most part the prose was highly readable and flowed well. The downside for me was the pacing and length. There were lots of long, detailed descriptions of horse riding and fights; however, the ending felt abrupt. I would have liked to have seen the story go for a little longer to flesh out the final scenes. Still, I found the characters delightful and I would certainly read any further books in the series.